Drivers crank their steering wheels to pull off the busy roadway into Thomsen's yard, located on Glenmore Trail east of Stony Trail, because the tree is covered with more than 100 stuffed animals. By early afternoon on a Saturday, Lisa Thomsen already had three people whip into her yard in Rocky View County on the southeast edge of Calgary. They arrive wanting to look at her grand, old willow tree that stands about 4.5 metres tall. Its branches are just as wide. But it's not the tree that catches the attention of drivers. 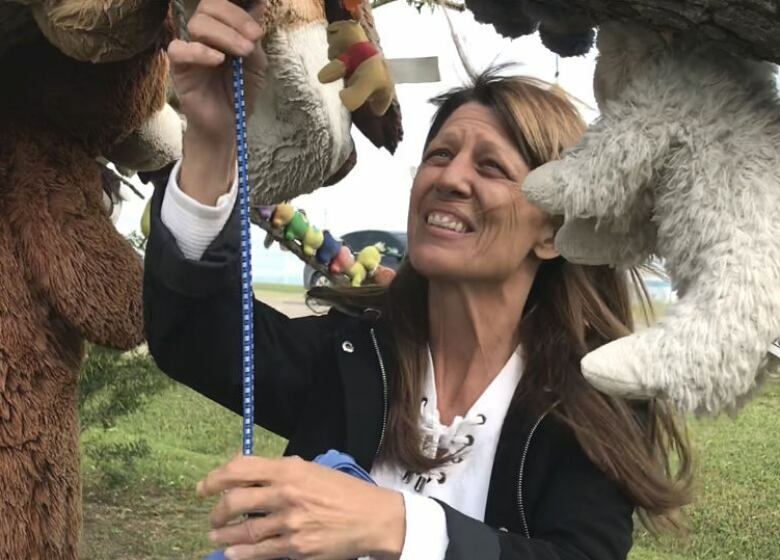 They're willing to crank their steering wheels to pull off the busy roadway into Thomsen's yard, located on Glenmore Trail east of Stony Trail, because the tree is covered with more than 100 stuffed animals. The colourful critters either hang from, sit tethered to or are stapled on weathered branches sprouting from a huge halo of thin, green leaves. There are bears, lots of bears: brown bears, white bears, bears with ribbons, big fluffy bears and bears hugging bears. There are monkeys, snakes, birds, butterflies and elephants. There's also a black and yellow unicorn — or it could be a dragon. "The majority of responses I get are very positive — and I've been told to keep going," Thomsen said. "When I'm out there maintaining the tree, I get lots of honks and lots of waves." Her tree has unwittingly become a roadside attraction, with passers-by using it as a backdrop for photo shoots. But only the really curious come knocking on her door, as I did. People stop to ask her questions, and then a new stuffed animal appears, often with a note about their earlier chat. 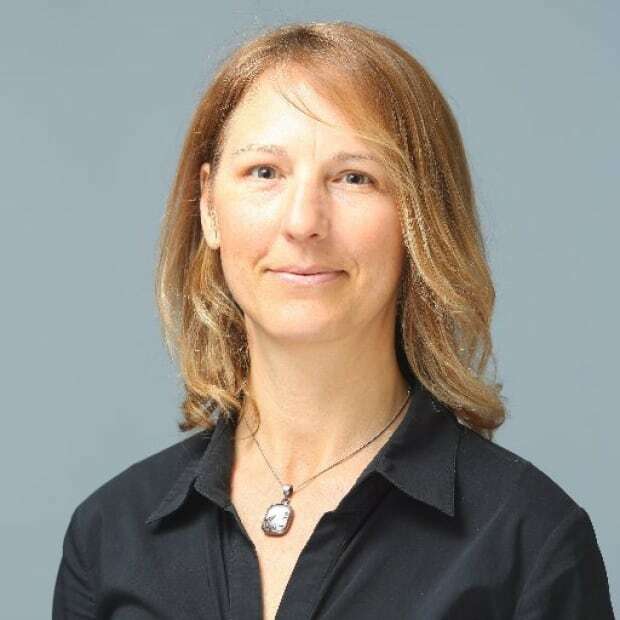 Originally, Thomsen just wanted to spruce up the yard to give commuters something to look at when they are stuck in traffic, which she says happens often. So she went to a second-hand store and found a good-sized stuffed lion. She tied it to her wire fence: majestic and silly. Perfect, she thought. She returned the next weekend and found a used whale. She hung it upside down from high up on the tree to mimic the way they suspend themselves in the water while sleeping. "The next day there was a three-foot giraffe standing next to the tree," she said. "And the day after that there [were] some more animals sitting under the tree. "And it's been non-stop. I get them every day, still, every weekend, still. It's been two years." Now there's a huge Bob Marley banana smiling with dreads, leaning back on the trunk, an orange striped Nemo resting along the bottom and a droopy Eeyore. My favourite is a slouching Winnie the Pooh bear, almost sleeping and wedged in tight between two branches. Families come up to her door with a child's stuffy in hand. A church janitor brought a garbage bag full of treasured teddies that had been donated by the Sunday school class. They all have a story and they all want to add their gently loved confidante, sleeping companion or security blanket to the tree. "I just think it means something to them to drive by and see something of theirs hanging on something they find so grand," Thomsen said. "Kids are just awe-inspired by this tree. They'll stand there. Their mouths are wide open. " Many don't even know what it the tree stands for. "Some find it morbid. Others thought it was just a memorial for a child I may have lost, but it's not," she said. "It's not a sad tree, it's a happy tree. It's fun, it's happy, it's whatever." But some may say it's much more than that. It's rare to find a space where people can pull off life's rushed and hurried fast lane to take a few moments to remember the joy felt as a child, when everything seemed magical, possible and wonderful. Most of the donations come from families from the hamlet of Langdon, driving to or from Calgary. Others are donations from as far away as Ontario, Manitoba and B.C. "I have no idea how they know but it just shows up here," she said. She says it's upturned her life. Caring for the creatures is a part-time job, and she already has a full-time one. She talks to the bears, hoses them down and fluffs them back up with a special brush. Some get handwashed. "I love my tree. I love the fact that most people love my tree, she said. "I think that that's worth it right there: one happy moment in time." She also welcomes the constant traffic into her yard. As long as they don't cut other drivers off or make any dangerous manoeuvres making their pit stop. Morteza Babolmorad, an arborist from Calgary, drives up while I'm talking to Thomsen. A large bear hanging by his paws caught his eye. "Reminds me of an animal's forest, an animal jungle," he said. "It's a beautiful view and it goes with the landscaping." He has a huge smile as he slowly steps around the tree. "Anything that makes people happy is good," he said. After hearing how the tree has evolved, Babolmorad said he plans to bring a stuffed animal when he returns. Thomsen plans to keep nurturing this tree and wants to see it covered from top to bottom. As long as the donations come, she'll continue to hang them. "Five years from now, we may look like a real wackadoodle farm," she said with a laugh.